Create new and edit existing integration between MVPDs and Channels. To create an integration, click Add New Integration in the Integrations section in the sidebar. Select a Channel and an MVPD to display the available MVPD endpoints for authentication, authorization, and logout. Always select a default endpoint for these selectors. To continue, click Create Integration. At this point, depending on the MVPD settings, a menu prompts you to fill in some additional properties. In this case, the additional properties are provided in advance by the MVPD. The video below presents an example of an integration which requires you to add additional properties. If the MVPD does not require any extra properties, you are redirected to the new integration page. Until now, the integration is not published to the back end servers and is not yet live. To publish the integration, navigate to the “Review Changes and Push” section at the bottom-left sidebar. Review the changes, add a description for the new integrations, and click Push Confirmation to confirm the configuration update. Review the individual modifications by expanding the accordion. In the example below, a test channel apasstest1 is integrated with the Rogers MVPD. Adobe recommends that you validate that the new integrations work using the API Test Site. You can access the API Test Site at http://entitlement.auth-staging.adobe.com/apitest/api.html. To seek help in using the API Test Site, click Help and Tools in the upper right-side of the screen. Request the access credentials from your Adobe Technical Account Manager. Perform the changes in Release Staging and validate them in the API Test Site. Perform the changes in PreQual Production and validate them in the API Test Site. Perform the changes in Release Production and validate them in the API Test Site. 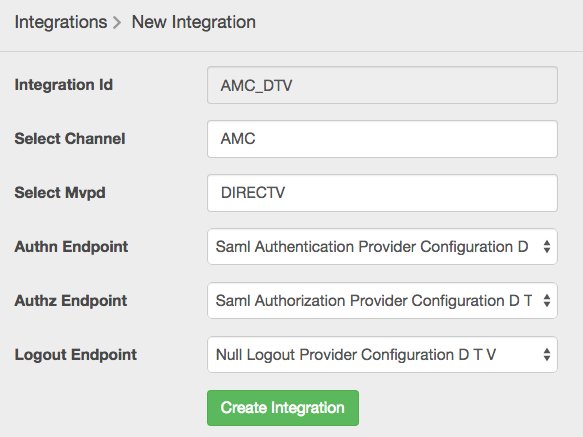 To update an existing integration, navigate to the integration page. This can either be done directly from the Integrations menu in the sidebar or from the Channels page, which contains an Integrations tab with links to the corresponding pages. The Integrations section of Adobe Primetime TVE Dashboard displays only a few of your existing integrations. However, all your integrations are live in the respective environments even though all the integrations are not displayed in this section. 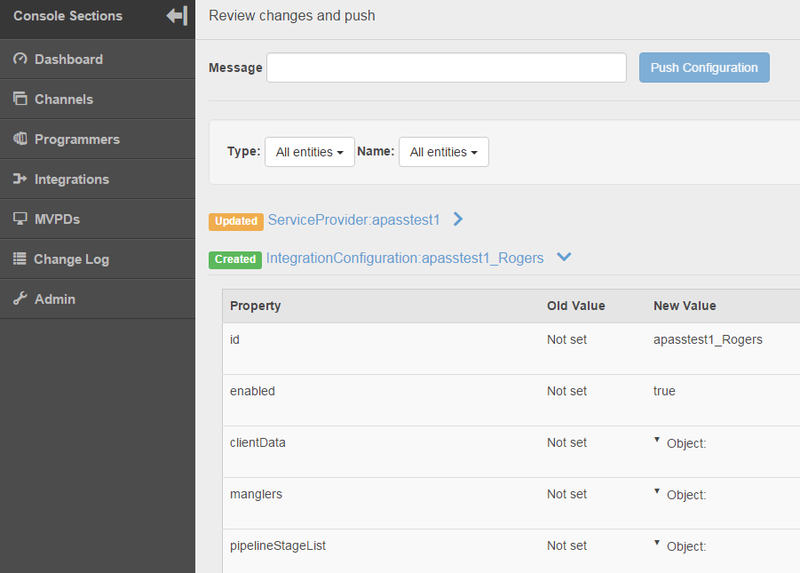 From the integration page, you can see and edit a few common settings from integrations. Typically, authentication and authorization token TTLs (time-to-live), and iframe settings are displayed. TTL settings are not available for the integrations with MVPDs that support Dynamically Defined Token Persistence TTL (see entry 1.19 in MVPD Integration Requirements). You can edit all settings by switching to Advanced Workspace mode from the page header. For more information, see the following video. From the integration page, you can override the above settings on a Platform level. 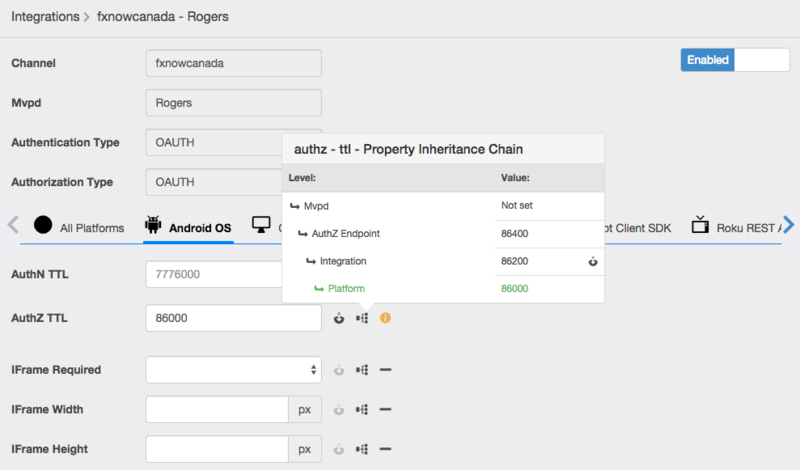 For example, select a custom value for the authorization TTL token on Android, default on every other platform. The settings inheritance chain is MVPD -> MVPD Endpoint -> Integration -> Platform, where Platform has the most specific value and MVPD the most generic default. After doing the modifications, navigate to the 'Review and Push Changes' section. Review your changes, add a description in the Message field for the modifications, and click Push Configuration to confirm the configuration update. The changes are propagated to the back end configuration repository and come into effect immediately in the corresponding environment. The changes are discarded if you close the session. Adobe recommends that you verify the changes using the API Test Site at http://entitlement.auth-staging.adobe.com/apitest/api.html. To seek help in using the API Test Site, click Help and Tools in the upper right-side of the screen. Request the access credentials from your Adobe Technical Account Manager. Adobe recommend that you do only a few modifications to the Dashboard in one go. Doing a few modification at a time ensures a greater degree of control over individual operations and an improved traceability of possible errors. For example, after adding an integration, press 'Review and Push Changes' to confirm. Adjust the TTL for tokens once the integration is confirmed.